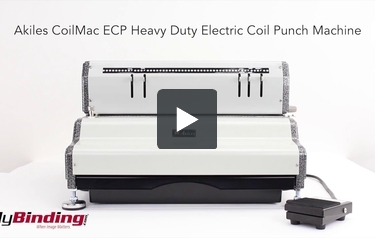 The Akiles CoilMac ECP41 Electric Coil Punching Machine is designed for professional, convenient, fast and easy punching. It is constructed from cast-hardened and heat-treated steel dies providing a premium strength and hardness. ECP41 is equipped with heavy-duty punch motor allowing single punches up to 25 sheets of 20 lbs paper. It features 5 disengageable pins specially designed to guarantee a clean punch with most standard paper size. Addition feature includes side and punching margin control, which delivers an evenly centered with the correct punch-margin-depth for all document sizes with every powerful punch. The Akiles CoilMac ECP41 made it easy to use with the electric punch operation, allowing the free use of both hands with the operator complete control of punching and inserting by a simple press of the foot pedal. 5 Disengageable Punch Pins: Specially designed disengageable positions guarantee a clean punch with most standard paper sizes. Depth Margin Control: 4 settings provide the perfect punch margin depth for different coil sizes. Foot Pedal Operation: Allows the free use of both hands, with full control of punching and inserting. Reverse (Anti-Jam) Function: For trouble free punching. Heavy-Duty Punch Motor: Single punches up to 25 sheets of paper (20 lbs). Open Punching Throat & Continuous Punching Guide: For an easy alignment & punching of longer documents up to 26". Hardened Punch Die System: Individually cast-hardened and heat-treated steel punch dies ensures many years of trouble-free operation. Welcome to MyBinding video. This is the Akiles CoilMac ECP Heavy Duty Electric Coil Punch Machine. To start up use of this machine, plug in the power and the foot pedal, then flip the switch to on. Next adjust the side margin control for whichever size page you have. In this example, we're using 11 inch paper. Next, adjust the depth margin control. Change this for different size bindings. Then release the appropriate disengageable punch pin. Slide your pages in along the side margin control. You can punch up to 25 sheets of paper at a time. Push the foot pedal to make your punches. If you use longer paper, you can use the continuous punching guide to align your punches for an even pattern. In case of a paper jam, push the reverse button on the back. It is also advised to periodically empty the bottom tray in order to avoid clogging the machine. This is a very sturdy machine, built for lots of use. It is the Akiles CoilMac ECP. For more demos, reviews and how-to's, go to MyBinding.com. Do you carry the supplies for this machine? Yes. We carry all of the coil you will ever need for the ECP. Just go to the coil section of the site and choose your options. There are more than fifty different colors and a ton of sizes to choose from. We can even make custom lengths for you if you need to bind oversize documents. Does this have an inserter? No this unit does not have a built in inserter. Instead it is designed for offices that are looking for a high quality heavy duty punching machine who either already have or are going to buy a coil inserter to use with the ECP. That way one person can punch while the other person binds.